Lulu and Lucy. 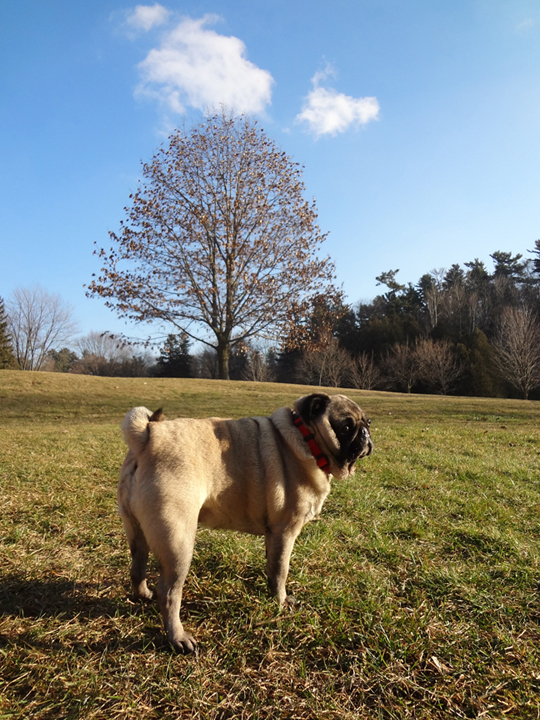 Our daughter's pug, with the Lucy oak beyond her. 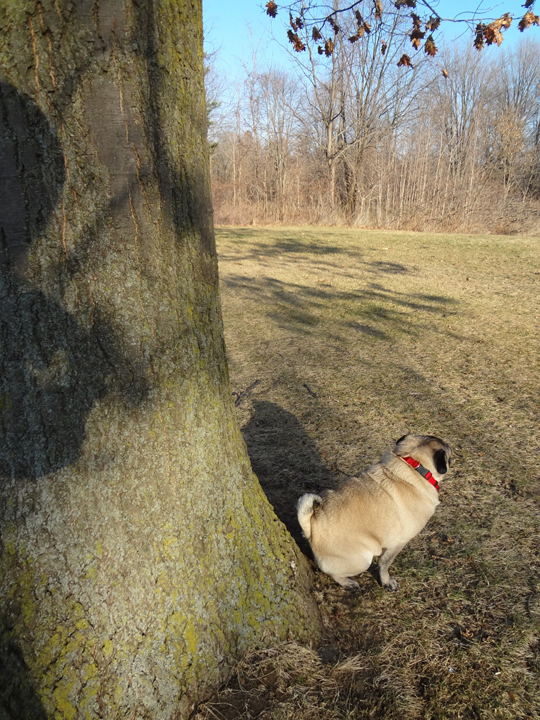 Lulu, an obvious devotee of the oakult. 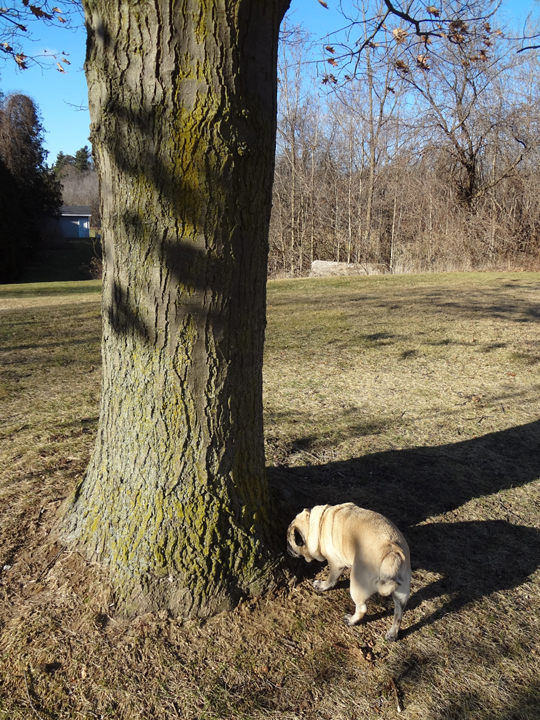 Most dogs, even strawdog, are interested in trees where they read and send their p-mails, and since strawdog was brought up in County Derry (in Irish - Doire - meaning "oak grove"), the oak (dair) is front and centre here. strawdog dares to unilaterally declare 2013 (and every year from now on) to be "The Year of the Oak", overriding and including the "Derry, City of Culture" designation now in force. The Year of Dair, The Year of Quercus. The oak has always played a large part in Ireland's past and in the past of all temperate climate nations, and that should be revived and celebrated. One oak in particular takes pride of place on this page. It is a lone, youngish oak (Quercus robur), no more than 20 years old, planted, we think, as a memorial to a Lucy Swanton Doyle (1890-1971) who was a journalist in Toronto. Despite her Irish last name she was of United Empire Loyalist stock who fled the United States some generations back and settled in Ontario, but who knows? ... that Doyle name might have Derry connections. 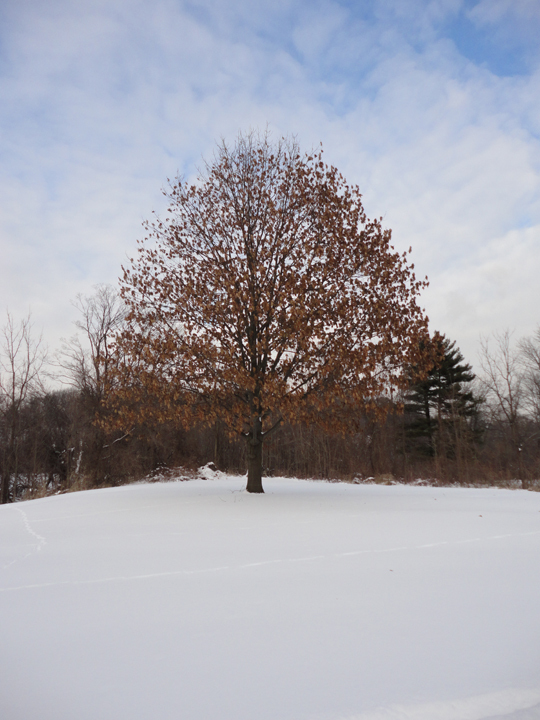 At first I thought Lucy had a school built at her own expense right near where this particular oak is growing in Highland Creek valley, Scarborough, Ontario. But no. The story is more complicated one and a somewhat tragic one. Children from all over the Highland Creek area went to this particular school right up until the 1920's. Many local children walked for miles to get here even in a typical Ontario winter. When two new schools were built on the higher land above the valley, the old school was no longer needed and Lucy bought the schoolhouse from the township to live in, along with about 3 acres of land around it. She was a Toronto Telegram journalist, "away ahead of her time" according to Don Allan of the local Scarborough Historical society. It must have been an idyllic spot but one day Lucy, described by some as an "eccentric", was trying to do a "controlled" burn-off of grass around our converted dwelling when the grass fire went wild and burned down the schoolhouse. The tragic part for her was that she had been writing a book about the area and her life in it. Not only were her manuscript and notes burned but all her collected columns from the Toronto Telegram were also lost. Essentially her whole life's work went up in smoke. The owner of "The Guild" estate down in Guildwood near Lake Ontario, allowed her to live in a cottage on his grounds, free of charge for the rest of her life. She may not have had enough years left to rewrite her memoir because we know very little about her journalism or her life other than these oral tradition scraps. The oak tree (below) may have been planted in her honour, but this has yet to be confirmed. The school would have been just beyond the bushes to the extreme left of the oak's trunk in this photo. The oak (a tree of knowledge?) and education seem to be natural partners. The Lucy Swanton Doyle memorial oak tree looking very handsome in July 2011. That's the Lucy oak right in the middle, photo taken in the spring of 2011. She looks a bit peekid but there will be more to come. New Year's Eve 2012. Quercus still hanging on to his/her tough leathery foliage. 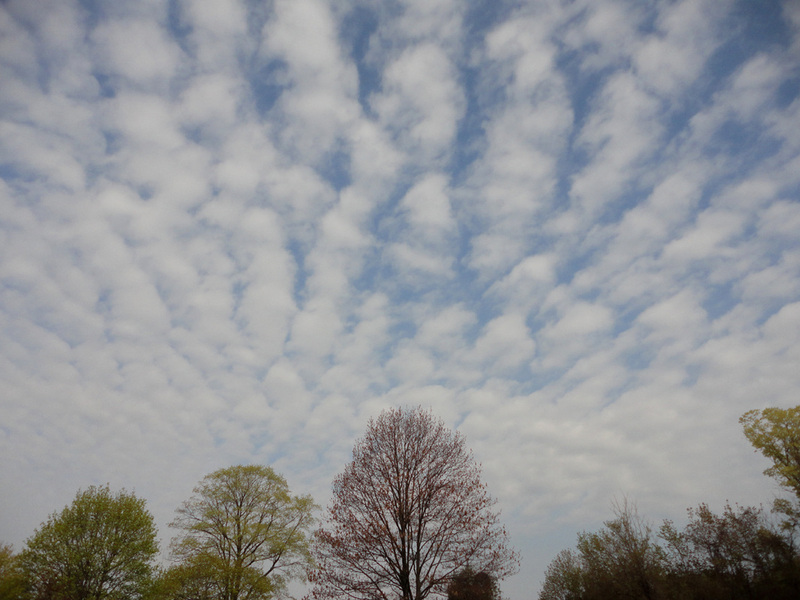 Early May 2013, almost all leaves gone but buds of new leaves sprouting. 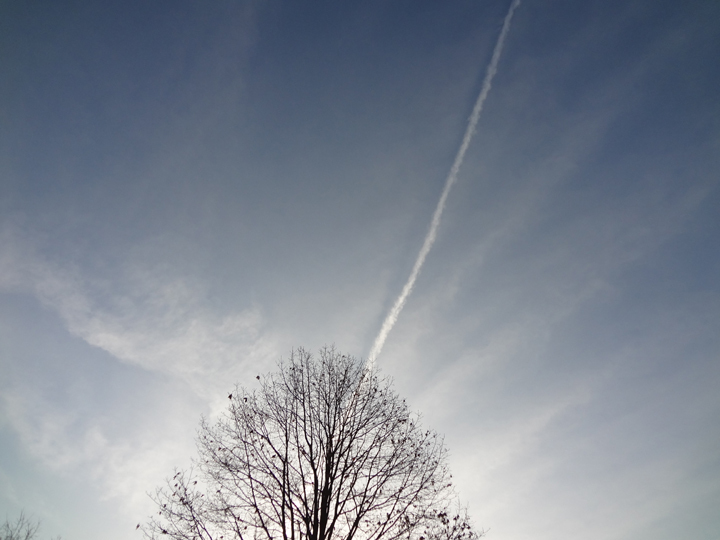 Only thing that spoils the image is the nasty contrail. 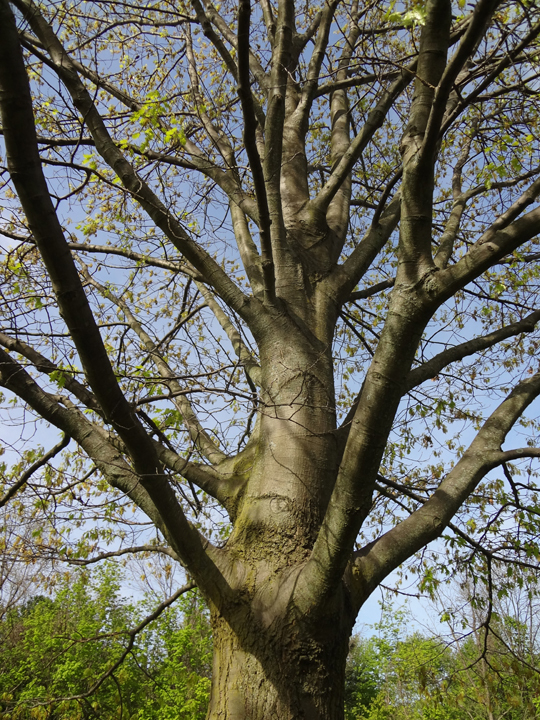 The Lucy oak budding, May 19, 2013.
triple trunk oak with trillium bed, not far from the Lucy oak. In his book Oak; Frame of Civilization by William Bryant Logan, he talks of wherever the oak was found (in temperate climes) humans settled and eventually grew civilizations, thanks to its food at first and then its tough, versatile wood, which paved the roads, framed the buildings and built the boats of empires. What trees do people plant in remembrance of loved ones? Oaks of course. What tree is mentioned most often in mythology, poetry, literature and song? In the western canon, at any rate, the oak is the essence of “treeness”. That phrase “that old oak tree” is central to many songs including the once hugely popular “Green Green Grass of Home”, covered by numerous singers. Then there's “Tie a yellow ribbon round the old oak tree”? And what about that heartbreaking song Bonny Portmore, about the demise of the oak forests around the county march of Derry and Antrim? The oak grove was a sacred place, a place for contemplation and religious ritual but the groves in Ireland got “cutten down” for firewood and to build homes and the boats of British Empire. Rome Rule moved its flock indoors, into buildings that tried in vain to recreate majestic arches and vaulting lines of an oak stand, where sunlight streamed down in rich seasonal greens and browns and reds through the animated, stained-glass foliage of oaks. The reverence for nature's most potent symbol, the family tree of evolution, was enclosed, herded, controlled, removed from its source, turned into a faux reverence for a tree of death, one dead upright and a dead cross piece its dead branches, on which hung a human pinned in agony like a fly to “wanton boys”. The beautiful tree of life was left outside, the devout passing by (now driving by) without a second glance, to enter these buildings and kneel before the tree of death. The oaks were dwindling in numbers everywhere on the island and only one part of Ireland hung steadfastly on to that connection to the very distant past when the oak grove was sacred to all, by naming itself in honour of the oak. Many smaller towns throughout Ireland have “derry” in their names, places where the oaks were revered, but there was to be only one Derry and it had all the makings of a beautiful place to be alive in. You can almost imagine it as place of pilgrimage where from all over Ireland those who understood the significance of oak-reverence gathered to celebrate. To them it would have been the most natural thing in the world to bend the knee(s), even if only to pick up acrons, in front of a visible beneficent providence, something very real, not just representing but being. It was acknowledging a debt to reality by genuflecting to the loftiest, most majestic living thing in your world as one of your most significant sources of food, shelter and comfort. If our ancestors had been aware of the findings of a nascent 18th or 19th century biology, they would have had even more regard for 'the lord of trees' since they would know that all trees provide us with the breath of life, the essence of 'pneuma', oxygen. It is ironic that the pejorative "materialism" of which science is accused by the religious, is now restoring a true connectedness to the real pneuma that issues from “fallen nature” in a much more life-affirming way than any theology can muster. Our ancestors' knowledge of nature didn't go as far as modern science's but they were fully intuitively aware of the oak's vital contribution to their very existence. But the barbarians came and they needed those oaks to build battleships to rule the seas and to build their halls and places of worship and to heat them with a hardwood that burned with a great heat. Soon the island was almost denuded of its oak groves. Now oak woods cover a scant 0.1% of Ireland. http://www.coford.ie/media/coford/content/publications/projectreports/cofordconnects/rm18.pdf The less there were, the weaker the old reverence for the living tree and the stronger the grip of the tree of death. Some places within the city of Derry, but ouside its inner walled fortress, still had oaks into the 20th century and one of those places was the grounds of St Columb's College where many boys of my generation went to school as a teen. See here. You couldn't be there walking “the walks” and not imagine a time when that hill was covered in the same trees you walked beneath in certain limited canopied areas like the one between the old handball alleys and the walls along Bishop Street or the “Bishop's Walk” along the top of the junior pitch behind the panorama photo of the students. Where the college chapel was built might have been an oak grove of exceptional significance to our ancestors because Rome Rule was always careful not to reject the sites to which its previously pagan flock once had such a strong physical and emotional attachment. If the new cult of the tree of death was to establish itself, it dare not stray too far from the sources of those crossed logs of dead wood, the sites they once dominated so majestically when they were alive. Shelter from the elements though, was essential in order to lure those pagans in and keep them in, the flock penned, a captive, silent audience who would not hear the birdsong or the windsong in the few remaining trees and of course could not see the trees, the clouds, or feel the rain and the cold, all of which would distract mightily from the readings and declarations of Rome Rule. So they butchered the trees and used the limbs to frame the pen. This separation of reverence from “fallen nature” was perfectly in keeping with the other-worldliness of theology and the placing of a resurrected god-man at the centre of worship. Needless to say, this old boy of St Columb's knew nothing of oak-lore when he, as a student there, walked the “Bishop's Walk”, mouthin' off about football, food or females, but the trees were “talking” too, mouthing away whether he knew it or not. On the bottom surface of every oak leaf there would have been hundreds of thousands of tiny mouths, opening and closing, communicating in the most fundamental way, breathing in what he breathed out and breathing out what he breathed in. He would have learned the word στόμα, stoma - mouth, in his Greek class in the Junior Study but he would not have associated it with oak trees on his walks. Is it too far-fetched to say that those oaks were teaching or preaching? Those who walked beneath them were learning, absorbing, taking in, unconsciously but very physically, what it was “saying” in the same sense as the gorilla in the novel Ishmael, by Daniel Quinn, was “speaking”. 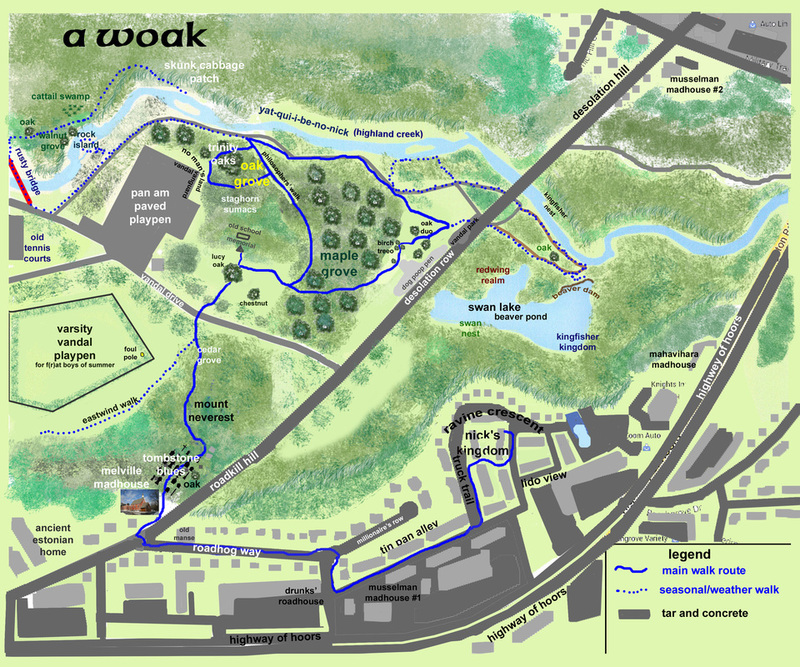 Was this where the term “philosopher's walk” came from? 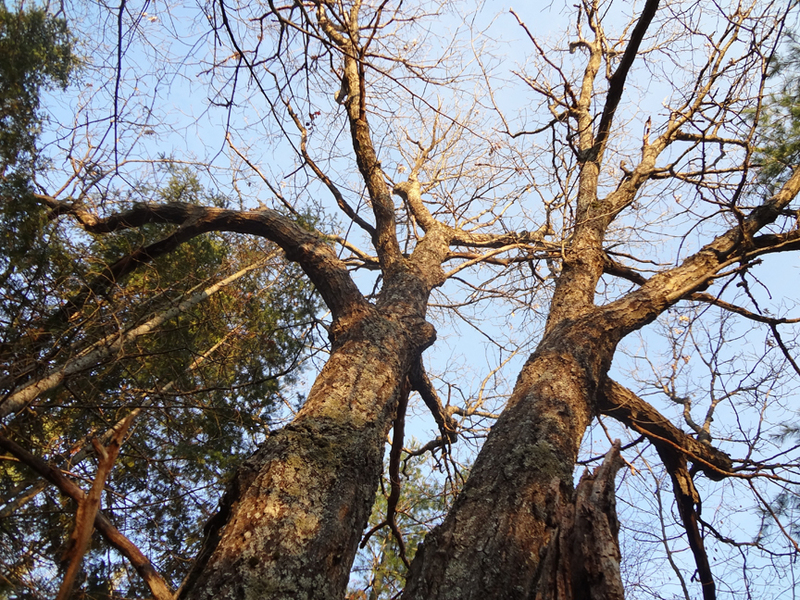 A place to walk among trees, especially oaks, to mediate and meditate among the wise ones? So the tree rustles in the evening, when we stand uneasy before our own childish thoughts: Trees have long thoughts, long-breathing and restful, just as they have longer lives than ours. They are wiser than we are, as long as we do not listen to them. But when we have learned how to listen to trees, then the brevity and the quickness and the childlike hastiness of our thoughts achieve an incomparable joy. Whoever has learned how to listen to trees no longer wants to be a tree. He wants to be nothing except what he is. That is home. That is happiness.” ― Hermann Hesse, Bäume. Betrachtungen und Gedichte. 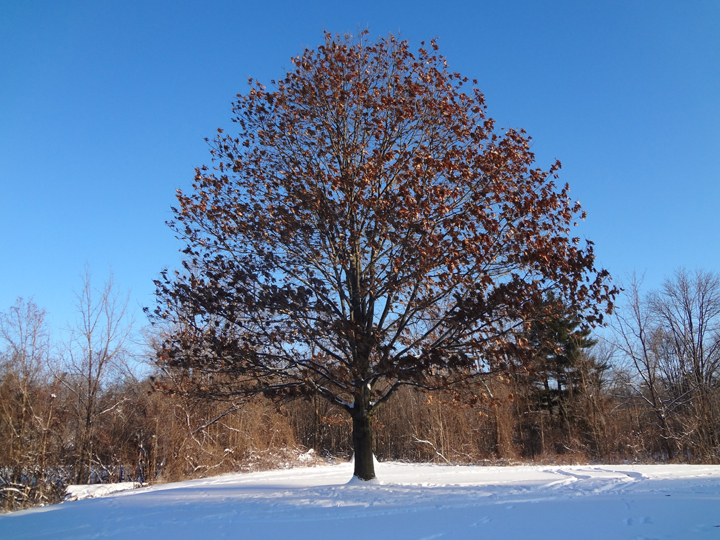 This photo on the left was borrowed from THAT TREE, the website of Mark Hirsch of Dubuque, Iowa who was recently featured on the Guardian website for his year-long cell phone photo diary of a solitary burr oak about a mile from his home. It's good to know there are other "oakultists" out there who have been smitten with Quercus. On the right is the first photo by strawdog of the Lucy Doyle Quercus robur in Highland Creek valley, taken on the 14th January, 2011, over 3 years ago. There are literally thousands of photos of this tree. 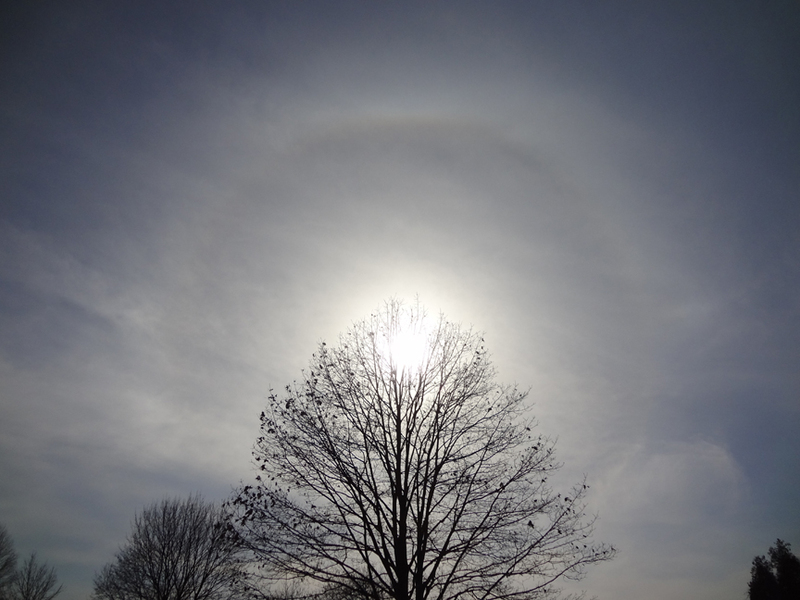 There are more images of the "Lucy" oak (and the skies/clouds above her) in the snaps section of this website. Just recently discovered Tracy Boyd's Sacred Threads website which has a section on The Goddess of the Oak, a literate, scholarly source of oak mythology and folklore. not just because it's about a particular oak but the sculptor's name is also Boyd. Boyds of a feather? and just to add another dimension to this oakfest here is a recent article from Scientific American about acorns and their comeback as a source of rich nutrition. Balanophagy rules! I recently tried eating a fresh acorn that had just been dropped off the Lucy tree above by a squirrel and found it a bit bitter from tannins but no worse than the initial shock of a shot of Bushmills Black Bush whiskey. This was on August 23, 2014 on a day when at least 10 squirrels were on a feeding frenzy up the Lucy oak. 2014 is one of those bumper crop years (@2-5 year intervals) for acorns and no doubt for squirrels too. I gathered many more acorns in late summer of 2014 and even more in another bumper crop in 2015, crushed the flesh from inside the acorn, leached it for about a week changing the water every day, dried the crumbled pieces and sprinkled them on my daily porridge mixture. It gives porridge the kind of edge you find in a good whiskey or a fine wine that has been aged in oak barrels. The result? It makes you strong like an oak ... nec flectitur nec mutant﻿﻿ (neither bend nor change; the Hegarty motto, not the Kelly one!) Well, that's the dream. "The Way of the Oak" or "The Stations of the Oak"
There are two sites here in Ontario where oak trees seem to invite a meditative walk amongst them, "a woak" through their shades. 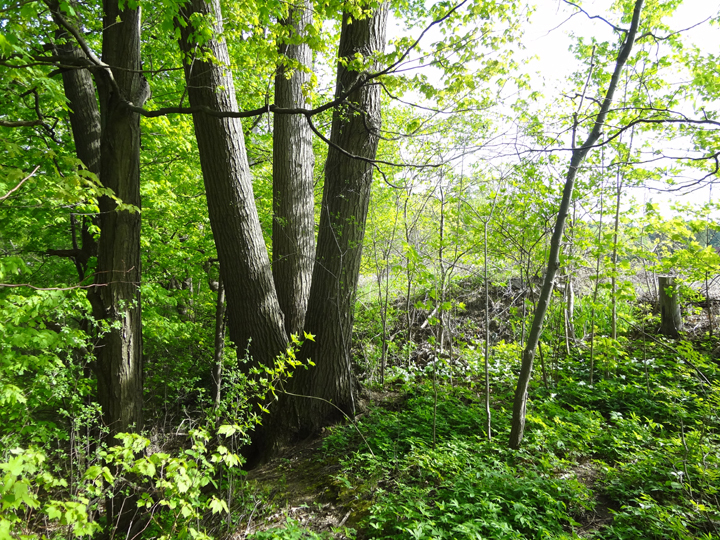 One is in Scarborough, in Highland Creek Valley one of Toronto's treed ravines. The other is 180 km north of Scarborough near White Lake in what used to be called Galway Township, now called Trent Lakes. This may all sound a bit 'New-Agey', a quasi-religious reboot of The Stations of the Cross or The Way of the Cross which was very much part of my Catholic upbringing in Ireland. So be it. 'Old-Agey' may be more accurate. It was one of the more enjoyable animated rituals that we surpliced and soutaned altar boys were recruited to perform, a chance to get down there among the congregation, catching the eye of friends, family and fair females while self-importantly carrying the tall brass crucifix or the sizeable candles in a Lenten procession accompanying the priest on his prayerful walk around the 14 stations marked by the gaudy relief-sculpted images of the God-man's torturous passage up Golgotha to his death, depicted on the walls of Straw chapel in the 1950s. Another source of oaknowledge is the wonderful, lavish, sumptuous book called The British Oak by Archie Miles about the ancient oaks of England, Scotland and Wales (unfortunately not of Ireland). It should go a long way towards reviving an interest in the oak, its importance in the history of civilization, its spiritual significance and its enduring beauty. "I cannot walk under trees without a vague powerful feelings of reverence. Calmly persuasive, they ask me to bow my head to the unknown god. In the evening especially when the main vocation is to suggest what eyes cannot see, the spacious and fragrant shadow of oak or pine is a temple which seems to contain the very power for whose worship it is spread." of motion, the sycamres, which are the chief tree of Cornwall, as the beeches and yews are of the Downs, the oaks of the Weald, the elms of the Wiltshire vales."